Описание: 84% Polyamide, 16% ePTFE description	Are there no boundaries to your sense of adventure? Are you always pushing yourself to your limits? 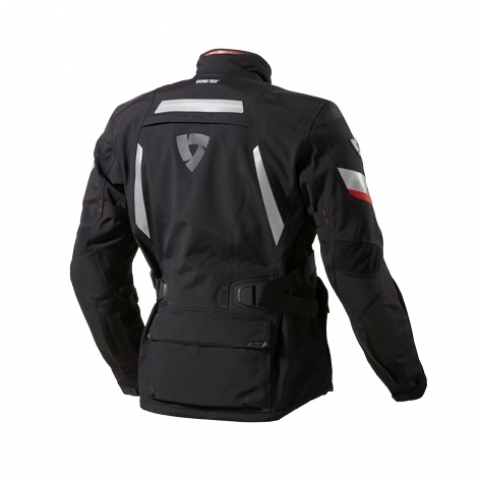 Then the Poseidon GTX jacket will suit you just fine. 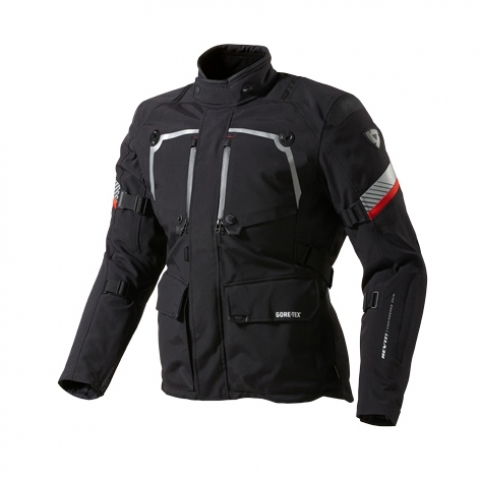 It feels lightweight, but appearances are deceptive as this jacket’s rugged outer shell is made for riding in extreme conditions. It has a very low water pickup and is 100 percent waterproof as the membrane is laminated to the outer shell. The innovative VCS | aquadefence with FidLock® magnetic fastener system offers excellent on-demand ventilation and can be closed with one hand while riding due to the FidLock® magnetic fastener. The FidLock® magnetic fastener not only uses the attraction but also the repulsion of magnets. 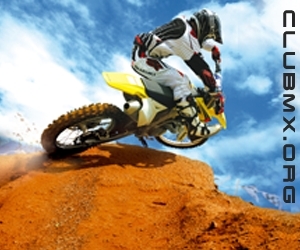 This leads to a robust closure with high locking strength that can still be easily opened with one hand while riding. With CE-certified protection, reflective panels, collar hook, connection zippers and the possibility to adjust the fit and the option to upgrade the jacket with a Challenger cool vest and HV Connector vest—this jacket offers the complete package. 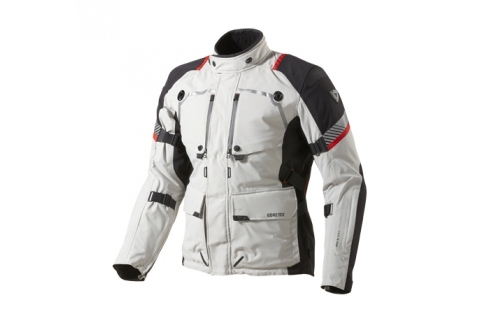 Sizes M-XYLriders	Adventure categories	Jackets weatherconditions	Hot Weather Rain All climates Cold logos	reviews	Poseidon GTX UK Bike 2014-Feb Poseidon GTX UK Ride 2014 Jan Poseidon GTX NL Bigtwin 2014-Jan Poseidon GTX DE Motorrad 2014-Jan videos	subcategories	Textile GORE-TEX® features	ERGONOMIC Ventilation air outlet at under arms VCS | zipper at back and under arms Our VCS zippers are all located in strategic positions, where they offer excellent air flow to cool the body. The air flow can be regulated by opening or closing the zipper. VCS | aquadefence When opened the aquadefence system allows direct ventilation to the body. When the zipper or panel is closed, it presses onto the incorporated rain gutter, the jacket is then 100% wind- and waterproof. When the panel or zipper is closed the rain gutter will stop the water from entering via the ventilation holes, thereby keeping you dry and comfortable. Features collar hook The collar hook and loop allow you to draw back the front side of the collar, allowing air flow to cool the neck during warmer periods of the year without the annoying flapping of the loose collar. prepared for vest connector HV The Vest connector HV allows you to the upgrade your jacket with a HV vest that quickly and easily attaches. The highly visible EN471-certified vest offers enhanced safety. stretch at elbows prepared for Challenger cooling vest insert The jacket is prepared for the Challenger cooling vest insert. The Challenger can be zipped directly into the outer shell with the connection zippers. short and long connection zipper Thanks to the short and long connection zipper, this jacket is/these trousers are compatible for pairing with any pair of trousers/any jacket in the REV'IT! line. VCS | aquadefence with FidLock® magnetic fastener Removable panels for optimum ventilation. Ventilation is nice on warmer days, but not as desirable in cold weather. The panels can be kept open due to the FidLock magnetic Fastener. The Fidlock® magnetic fastener not only uses the attraction but also the repulsion of magnets. This leads to a robust closure with high locking strength that can still be easily opened with one hand while riding. Pockets back pocket waterproof stash pockets inner pockets hand warmer pockets Adjustability UTA | tab at cuffs Ultra thin adjustment tab at cuff or leg. Thanks to laminating technology, the material of this UTA | tab is extra thin. 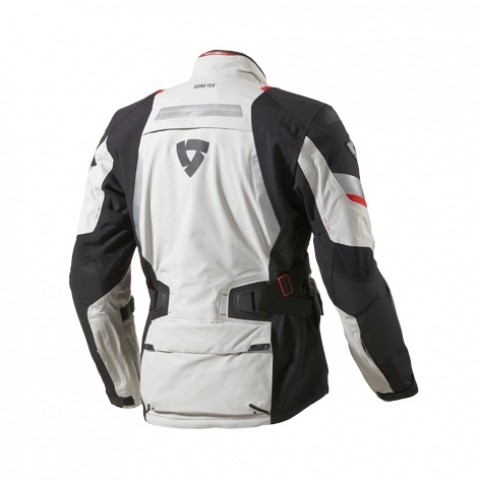 This allows you to comfortably wear the sleeve of your jacket under the cuff of a glove, as many riders prefer to do. This technology can be found in most garments in the collection, and also as cuff tabs on the legs of textile trousers. adjustment drawcord at hips adjustment straps at waist flexisnap The REV’IT! flexisnap makes it possible to adjust the collar circumference easily and personalize its fit to each rider. A jacket is often worn in more then one season, and the flexisnap makes it possible to adjust the collar within seconds. During winter a wider collar circumference accommodates combining the jacket with a balaclava or wind collar, while during summer, a wider circumference lets an all-important cooling wind into the collar. The flexisnap is available with 5 or 7 positions (XL). adjustment strap at upper and under arms Fit tour fit regular PROTECTION Protection fully perforated EVA foam at back EVA is one of the materials popularly known as 'expanded rubber' or 'foam rubber'. EVA is used as a shock absorber in many REV’IT! products. prepared for Seesoft CE-level 2 back protector insert - Type RV The back protector pocket in this REV'IT! garment is tailor-made to accommodate the Seesoft CE-level 2 back protector insert Type RV - an easy upgrade to maximize safety. SaS Tec® CE protection at shoulders and elbows SaS Tec® armour offers the best possible protection during a dynamic impact. The armour is made of a new polyurethane foam material, without a hard shell or edges, which surpasses the required CE-values by 50%. The closed air cells function by means of progressive absorption: with a slowly occurring stressor, the material remains soft and flexible, whereas sudden impact will cause the protector’s air cells to respond quickly with increased resilience, creating a protective shield where the rider needs it most. SuperFabric® panel at shoulders and elbows SuperFabric® technology is an advanced process that transforms ordinary fabrics into unique, highly protective materials. Multiple protective shields are applied close to each other within the fabric, but remain separate to allow maximum flexibility. These micro guard-plates provide an additional layer of protection, without adding weight, and help prevent abrasion to underlying fabrics. SuperFabric® is five times more abrasion-resistant than leather, with just half the weight. 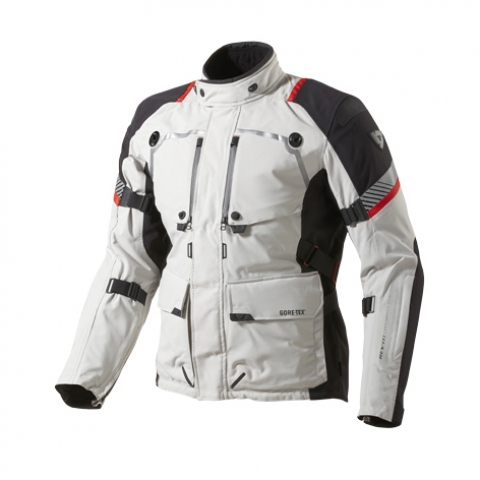 Insulation detachable thermal liner Outer shell 3L stretch GORE-TEX® Pro fabric This stretch-woven Pro Shell performance laminate allows freedom of movement, while keeping all the advantages of GORE-TEX® Pro Shell 3-Layer technology. 2L nylon 600D GORE-TEX® fabric This fabric is made of rugged 600 denier high-tenacity nylon that delivers superior abrasion and tear resistance. Laminating the GORE-TEX® membrane to the nylon fabric creates a 100 percent waterproof, windproof and highly breathable outer shell that offers excellent wearer comfort. polyester rib Polyester fabric is a mainstay of REV’IT! garments, providing the stylish silhouette that our apparel is known for. This polyester fabric features a specific rib weave, for optimal performance. wax polyester 600D Long-lasting 600-denier fabric is a mainstay of REV’IT! apparel. This high-tech polyester features a specific rib weave for rugged durability and a refined finish for optimal performance. The 600D rating delivers excellent tear-resistant properties while the wax coating ensures capable water proofing. Lorica® Lorica® is constructed from microfibres that give the material characteristics similar to those of natural leather, including a leather look. This low-maintenance material is not as strong as leather, but softer and lighter, with a consistent thickness that makes it easier to process. 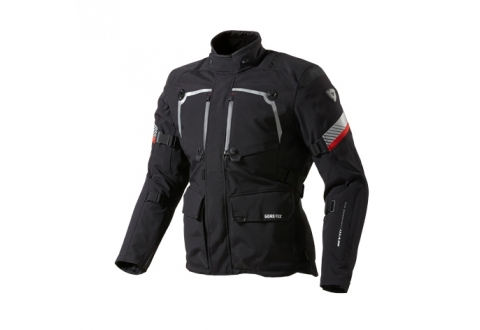 3L GORE-TEX® Pro nylon 600D fabric GORE-TEX® Pro shells are made for riding in extreme conditions. 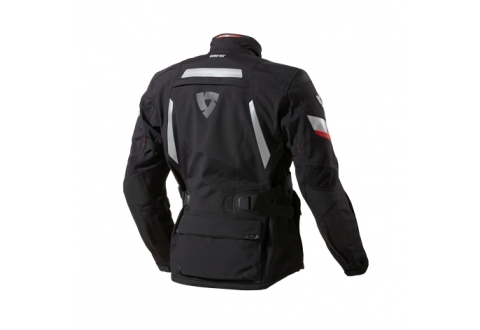 The fabric is made of rugged 600 denier high-tenacity nylon that delivers superior abrasion and tear resistance. A high-performance GORE-TEX® membrane is bonded to a tough outer material and a specially developed, robust inner lining makes it a 3-layer. The benefits of a 3 layer are less water pick up of the outer layer which results in breathable comfort for all weather conditions. SuperFabric® SuperFabric® technology is an advanced process that transforms ordinary fabrics into unique, highly protective materials. Multiple protective shields are applied close to each other within the fabric, but remain separate to allow maximum flexibility. These micro guard-plates provide an additional layer of protection, without adding weight, and help prevent abrasion to underlying fabrics. 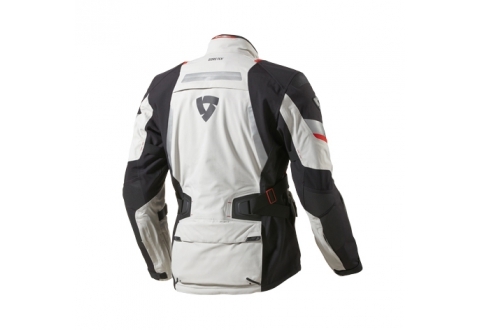 SuperFabric® is five times more abrasion-resistant than leather, with just half the weight. Visibility laminated reflection at chest, back and upper arms Reflection panels ensure excellent visibility at all angles, allowing the wearer to be seen from all directions. To offer a more sophisticated look, the reflection panels are welded to the fabric. This welding process also eliminates stitching seams, making the garments safer. Waterproofing & Breathability 2L GORE-TEX® fabric By laminating the GORE-TEX membrane to the fabric, a 100% waterproof, windproof and highly breathable outer shell is created, offering unsurpassed durable wearer comfort.